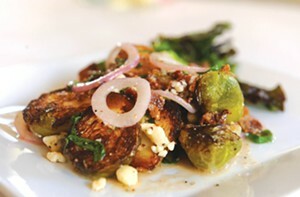 Downtown bistro Chez Foushee has a seared Brussels sprouts salad that can convert a nonbeliever. Between the bacon, blue cheese, candied walnuts, fresh mint, red onion and red wine vinegar, you’ll find yourself falling for the very same little cabbages that kids have been spitting out for generations. 203 N. Foushee St., 648-3225.